What's it about? For reasons that are brilliantly never explained, or even remarked upon, Walter the muppet and Gary the human (Jason Segel) are brothers. On a trip to LA with Gary's girlfriend (Amy Adams), they discover the old Muppet theatre is to be torn down by maniacal businessman Tex Richman (Chris Cooper) unless they can find $10million somewhere. There's only one solution : persuade Kermit the Frog to get the whole gang together for one last fund-raising, inspirational, celebrational, muppetational Muppet Show! But will the world remember them, or even care? Is it any good? You are never, ever too old to laugh at The Muppets. Fact. This is great fun, smartly playing on the nostalgic memories of those who would have grown up with The Muppets on TV, but also acknowledging that times have changed, leading to some unexpectedly poignant moments as Kermit, Fozzie Bear, Gonzo & Co wonder whether they can ever hope to recapture the camaraderie of the good old days. 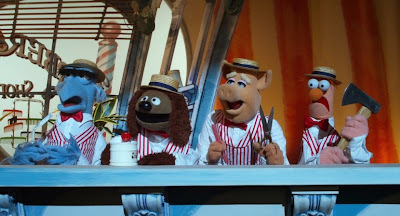 But that reflective element is not at the expense of some wonderfully silly Muppet madness, including self-referential gags, movie in-jokes and Fozzie's one-liners. Perhaps inevitably, the human cast is rather sidelined (although Cooper's maniacal laugh and impromptu rap are unexpected treats), whilst the cameo guest-list, which once promised appearances by George Clooney and Brad Pitt, now makes do with the underwhelming likes of Whoopi Goldberg and Mickey Rooney. 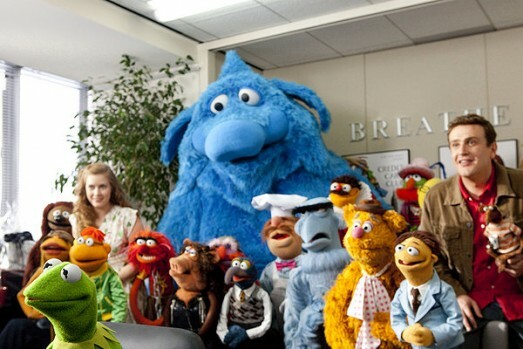 But who cares about mere humans when we can welcome back old favourites like Animal (under-going anger management), Miss Piggy (now employed by Vogue), the Swedish chef (hurdy, burdy, gurdy) and the peerless Beaker (meeee, me, meee, meee). Music-wise, the original songs range from joyfully comic to infectiously toe-tapping, but they pale in comparison with a chicken version of Cee Lo Green's Forget You and a sublime Barber Shop version of Smells Like Teen Spirit. And if that doesn't make you laugh, there's always Fozzie's fart shoes. So what if it's a bit uneven and thinly plotted? By the time it reaches the big crowd-pleasing climax, you'll be punching the air and grinning from ear to ear like Dr Teeth. Quite simply, it'll make you feel happy. Anything else I should know? Flight of the Conchords fans will be delighted with the input of Bret McKenzie, who acted as music supervisor on the film and who is now the proud owner of an Oscar for Best Original Song, for the song 'Man or Muppet'. It's really quite a good tune, but it's no Mahna, Mahna, though. What does the Fonz think? Fonzie's on holiday this week, so we've got two very special guest reviewers instead. What do Statler and Waldorf think?